Welcome to the release of new images for High Hopes Rubber Stamps!! The new release is called "Woodsy Christmas" and is shipping soon. 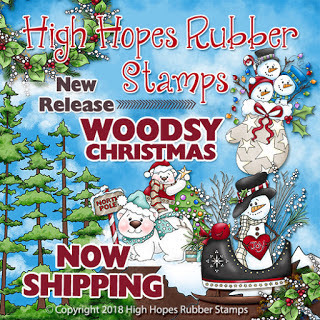 The new release features adorable images and today I am sharing with you all "North Pole Penguin" and a sentiment also from High Hopes Rubber Stamps. I have colored the image with Copic sketch markers, and then used some white fun flock on the trim of the hat. The dp is an older paper from Carta Bella's All Bundled Up collection. Please be sure to check out the rest of the design teams wonderful creations featuring the newest images from High Hopes on the One Crazy Stamper blog here. Wow what an adorable card! Love your colouring and that fun fur trim! !